December 12, 2011 - The holiday season is a time for sharing with family and friends. But, it's also a time for sharing with those in need. Whether its food, winter clothing, or money, many Americans choose this season for giving to others. Others choose to give something we all feel is in short supply, time. And on Saturday, generous volunteers who devote their time, energy, and creativity every year to the United Airlines Fantasy Flight. 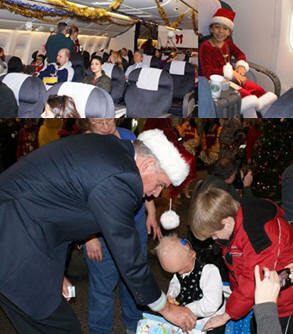 Fantasy flights are charity flights operated by a host airline for locally disadvantaged and terminally ill children to fly to a fictitious destination. The destination is often the North Pole, the home of Santa Claus' workshop. Employees and locals often including firemen and police officers generally donate their own time and labor to decorate either a gate area or a dedicated terminal area. Employees often don costumes including magicians and Santa's helpers known as elves to entertain the children. Various gifts and take-away bags often accompany the Christmas and holiday seasons' theme. Often, local companies and charitable organizations are sponsors. Host airlines donate venues (gate areas), aircraft, fuel, and fellow sponsors. The cost is virtually always free. With the Fantasy Flight, which began 20 years ago at the Washington area's Dulles International Airport, participants in the United Employee Volunteer Program help bring a little holiday magic to seriously ill boys and girls from Children's Hospice International. The children and their families boarded a Boeing 777 from gate D-7 and took off for the brief flight to Santa's workshop. The "workshop" an entire wing of the terminal was completely decked out in holiday decorations and featured a host of volunteers in costume, carolers from a local high school, firefighters, fairy tale princesses, members of the military, local sports mascots, lots of elves, and Rudolph the Red-Nosed Reindeer. The boys and girls joined in different activities and ate delicious treats. U.S. Secretary of Transportation Ray LaHood attended the function and brought M&Ms from the White House at the request of President Obama. But all of the hubbub of the workshop was nothing compared with the kids' wide-eyed excitement when the real guest of honor, Santa Claus, arrived. In true form, Santa's bag was full of gifts for everyone. The first Fantasy Flight occurred in London in 1991, when United Airlines donated a 727 to fly one hundred children from an orphanage to Lapland, Finland, for reindeer sleigh rides and a visit to ?Father Christmas Village?. The success of that first flight led the airline to gradually expand to more than forty six cities, providing children around the world with the experience of a lifetime. LaHood said ?It was a pleasure to meet the boys and girls of Children's Hospice International at this year's Fantasy Flight. And it warmed my heart tremendously to see the holiday cheer all of the volunteers brought to those brave kids. ?